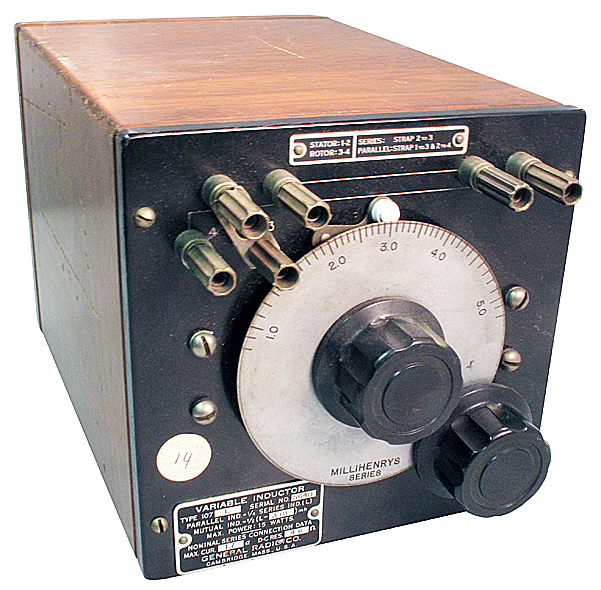 General Radio 1021-A standard signal generator. 250 - 920 MHz, 0.5 µV to 1 volt output at 50 ohms. 0 - 50% AM modulation. Operates on 115 or 230 vac, 50 / 60 Hz, 50 watts. Output via 874 connector. Line cord not included. 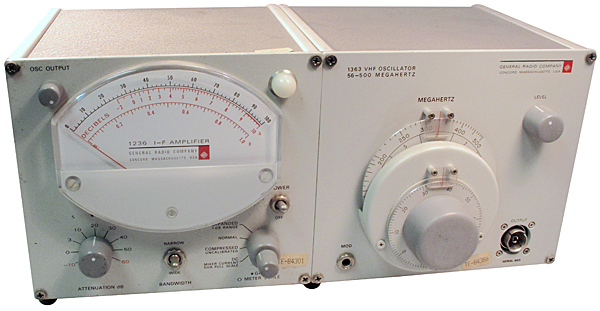 14-3/8"H x 20-1/4"W x 10-7/16"D.
General Radio 583A audio wattmeter. 5 mW full scale. 2.5 to 20,000 ohms impedance. In fair condition. First designed in 1933. 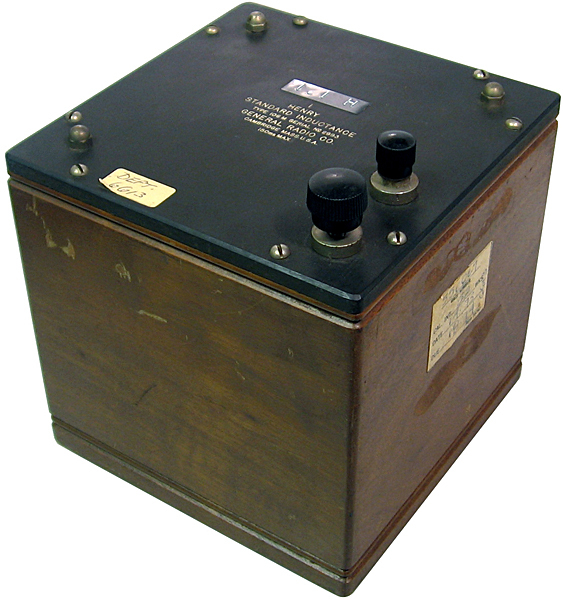 General Radio standard air capacitor. 100pf ±0.2%. 1,500v max peak. 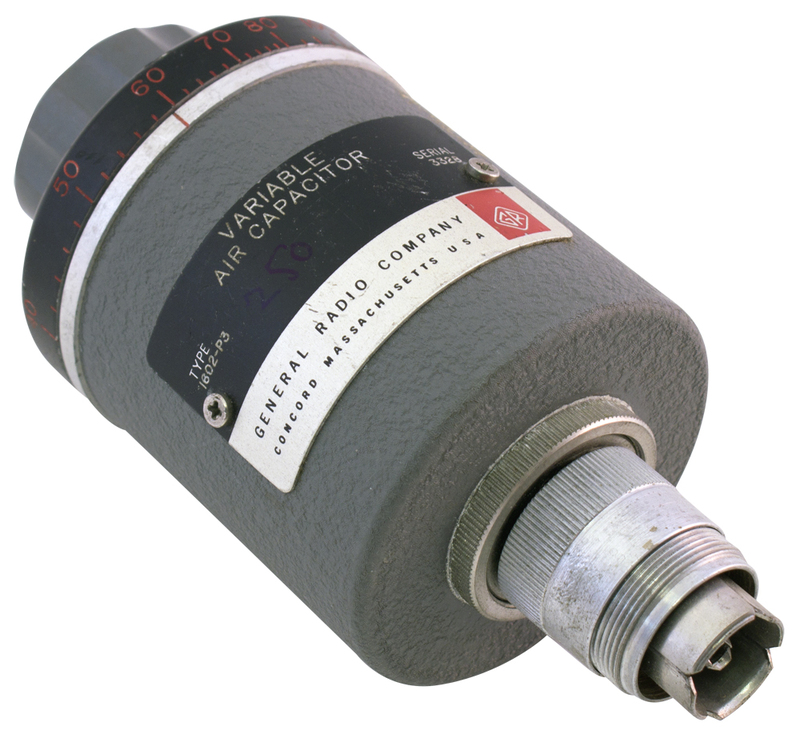 General Radio variable air capacitor. 15-75pf. 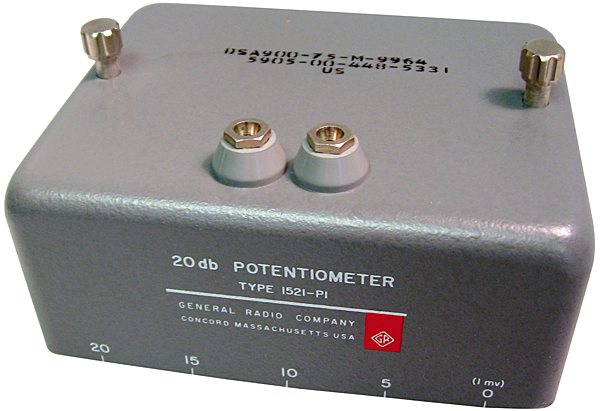 For use with 1602-B admittance meter in 40-150 mHz ranged. 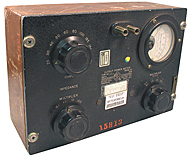 2.6"D x 5.4"L.
General Radio unit IF amp. Pairs with CNT detector. July 1961. 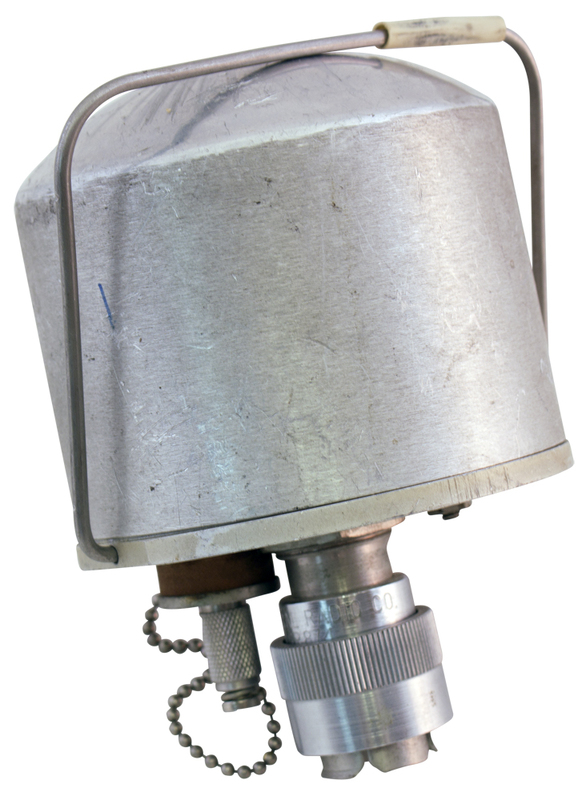 The purpose of this unit is to serve as part of an RF null detector that rejects noise and interfering signals. It contains four IF amplifier stages tuned to 30 MHz. With the appropriate unit oscillator and mixer-rectifier it forms a sensitive heterodyne detector for VHF and UHF bridge measurements. Manual available on this page. General Radio shielded component mount to GR-874 connector. General Radio 1218-A unit oscillator. 900 MHz to 2 GHz. Output: 110 mW to 160 mW into 50 ohm load. Requires 300 vdc @ 70 ma and 6.3 vac @ 1 amp. Power cable connector is removed. 12" x 7-5/8" x 7-1/2". NSN: 6625-00-674-3284. Sold as-is. 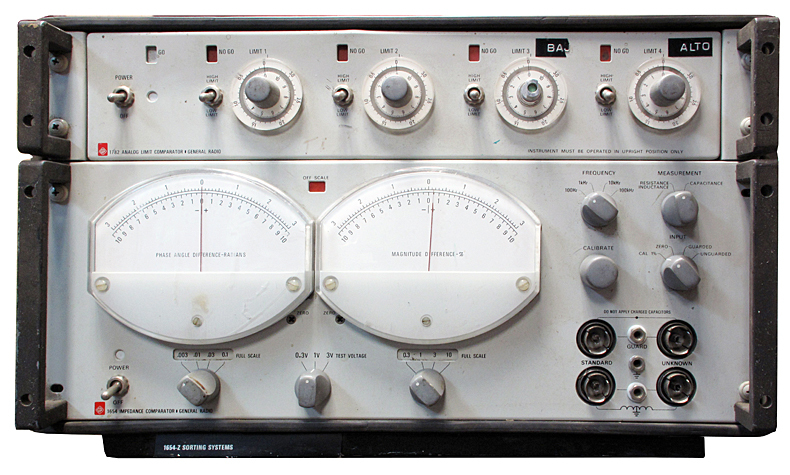 General Radio 1654 impedance comparator with 1782 analog limit comparator. Indicates difference in magnitude and phase angle between two external impedances, usually a standard and an unknown. 1782 Analog Limit Comparator gives Go / NoGo indication when sorting parts for within tolerance values of resistance, capacitance and inductance. 12" x 19-1/2" x 15". NOTE: For parts only. Missing inter-connecting cables and fuseholder caps. No power cords. One knob missing cover. Sold as-is. 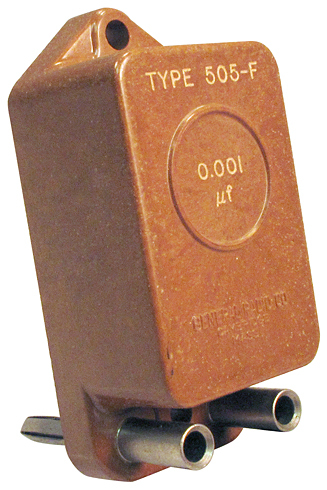 General Radio 1490-D Decade Inductor. 1 mH to 11.11 Henry in 1 mH steps. Tolerance less than 2%. One binding post insulator is cracked. 8-1/2" x 4-1/4" x 15-3/8". NSN: 6625-00-553-7655. General Radio 107L variable inductor. 0.8 mH to 5.2 mH. 15 watts maximum power. 6-1/2" x 6-1/2" x 8-3/4"H.
General Radio 107M variable inductor. 7 µH to 54 µH. 15 watts maximum power. 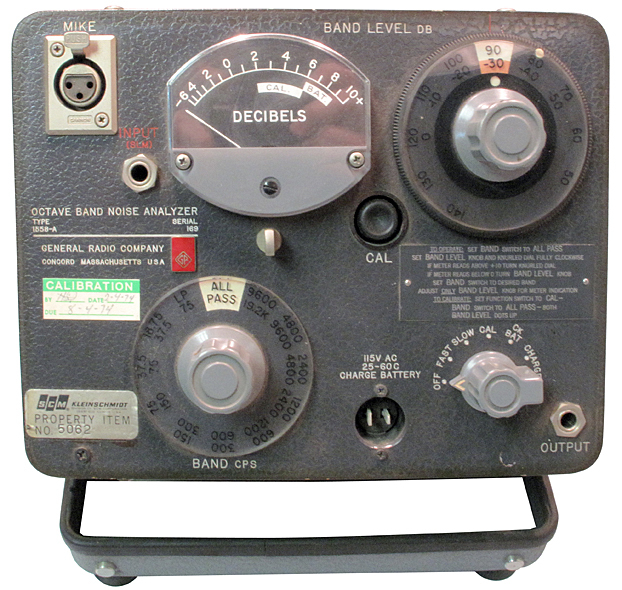 6-1/2" x 6-1/2" x 8-3/4"H.
General Radio 1558-A octave band noise analyzer. 11 frequency bands from low to 75 Hz to 9600 - 19.2 KHz plus all pass. 44 to 150 dB input range. In fair condition. Battery accepts charge, unknown life. Service tag notes: "Will not calibrate". Sold as-is. No accessories available. 7-5/16" x 9-1/4" x 8-3/8". 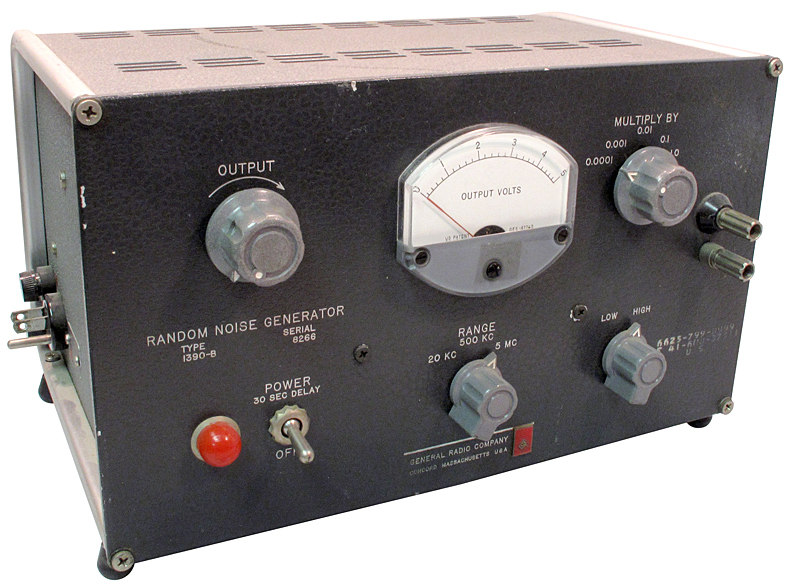 General Radio 1390-B random noise generator. 3 ranges. Output from 0.1 mV to 1v. 105 - 125 / 210 - 250 vac power input. 50 - 400 Hz. 12-3/4" x 9-3/4" x 7-1/2"H. No line cord. Appears to work. NSN: 6625-00-799-8999. General Radio 1390-B random noise generator rack mount version of the above unit. 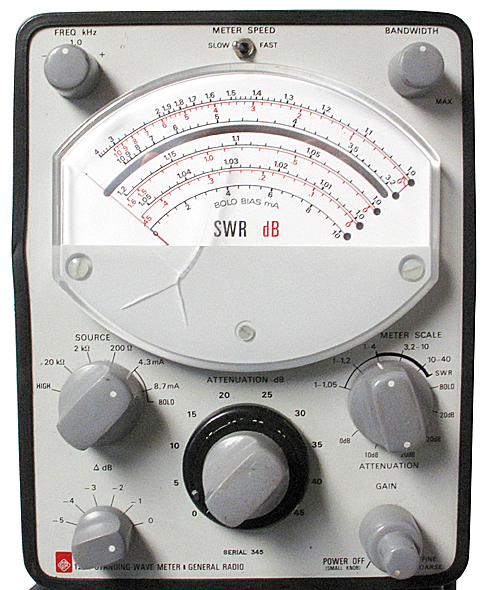 General Radio 1234 SWR meter. Appears to work but crack in meter cover. One nut and spacer missing on handle. 115 or 220 vac, 50/60 Hz power required. No accessories supplied. 7-15/16" x 9-1/4" x 8-3/8". General Radio decade resistor. 6 dials. 0.1 ohm steps. Maximum resistance = 11,111.1 ohms. 17.3" x 3.5" x 5" deep. Weighs 4.5 lbs. Brand new in the original box!! 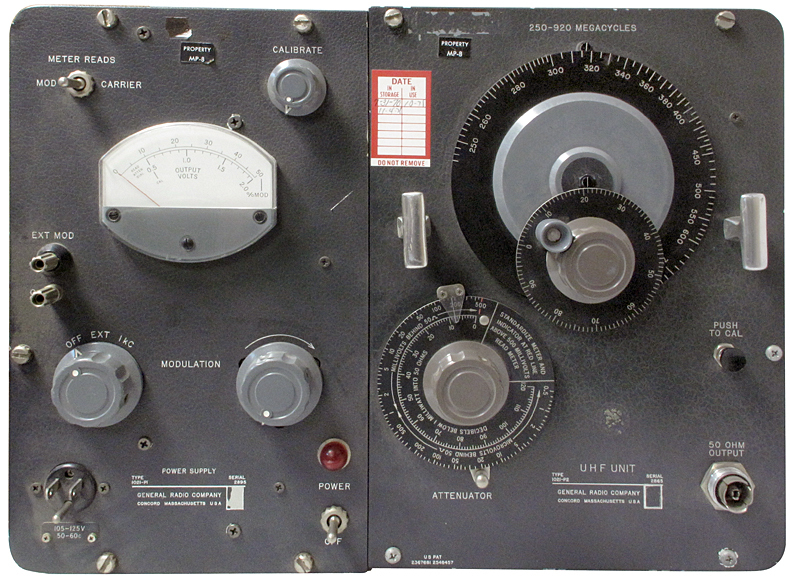 General Radio sweep frequency reflectometer. 20 -1500 MHz. Excellent condition. 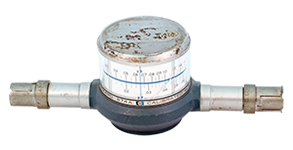 General Radio 0 - 20 dB potentiometer for use with 1521-B Graphic Level Recorder. 5-1/2"W x 4-1/2"D x 2-3/4"H. 4 pin plug-in. NSN: 5905-448-5331. New, unused. 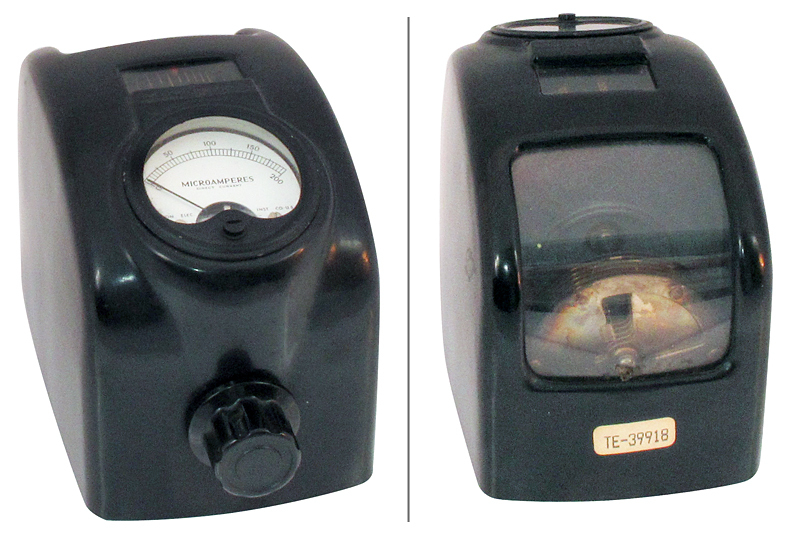 General Radio GR-1140A UHF wavemeter. 250 MHz to 1200 MHz. Butterfly capacitor and inductor thru a IN22 diode to a 200 µA meter. 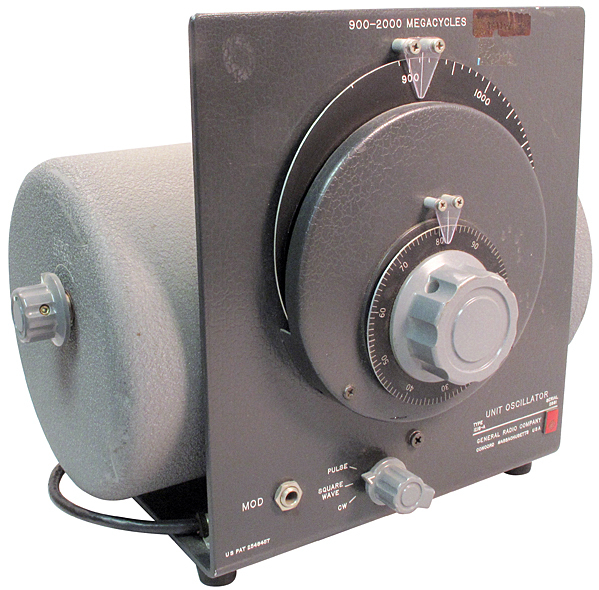 General Radio 1450-TAR Decade Attenuator. 1 dB to 110 dB in 1 dB steps. 600 ohms, 1 watt maximum, ±1%, 0 - 1 MHz. 19" x 12-1/2" x 5-3/4". General Radio 1432-Q decade resistor. Four dials, 100 ohm steps. 100 - 1.111 Meg. 100k ohm range: 2.3 ma, 10k ohm range: 7 ma, 1k ohm range: 23 ma, 100 ohm range: 80 ma. Dimensions: 4-1/4" x 12-1/2" x 3-1/2". Bishop Instruments trombone setter. 0 - 50 cm constant impedance. Alt. P/N: 933-8150. General Radio P/N: 874-LTL. General Radio 1652-A Resistance Limit Bridge. 1 ohm to 1,111,111 ohms with internal standard. 1 ohm to 2 Meg ohm with external standard. 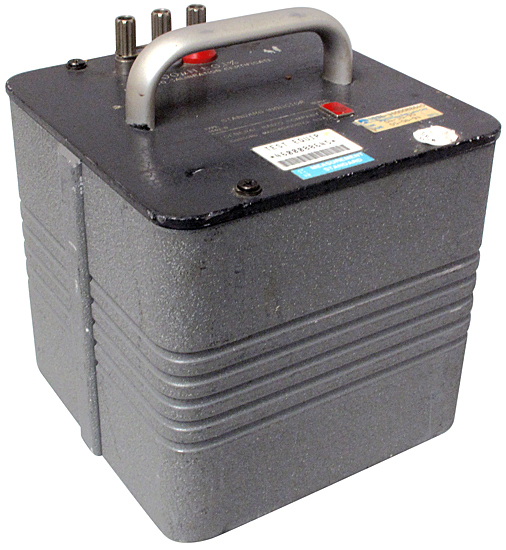 Operates on 105 - 125 vac, 60 Hz, 30 watts. 19" x 8-3/4" x 12-1/4". General Radio 1363 Unit Oscillator. 56 MHz to 500 MHz. 200 mW into 50 ohms. Attached to 1236 IF Amplifier. 16" x 7-3/8" x 8". 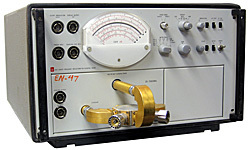 General Radio inductance standard. Calibrated to 1.1 Henry. 150ma max. 6" x 6" x 6-1/2". 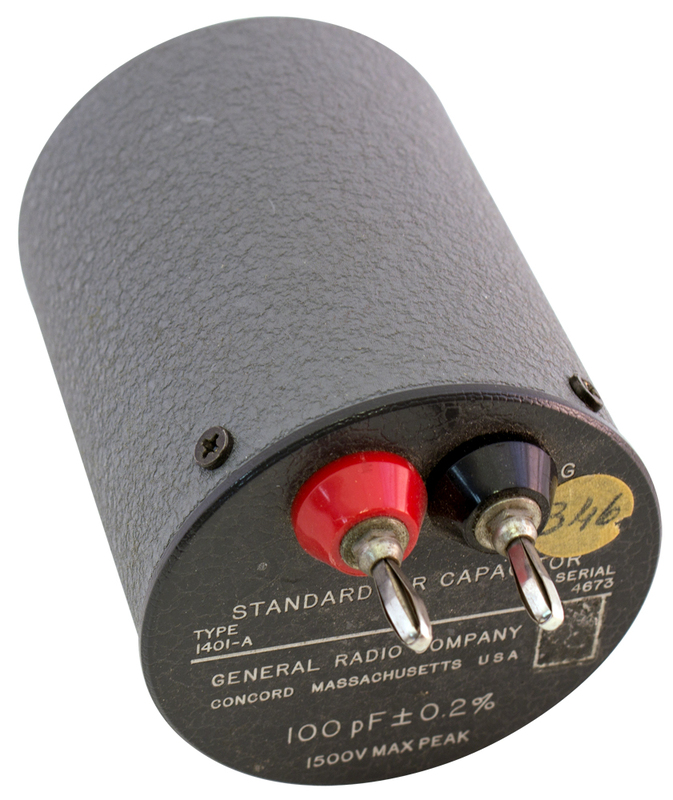 General Radio 874-VC Variable Capacitor. 14 - 70 pF. In the original box. General Radio 1423-D Standard Inductor. 500 µH, 0.1%. Resonant frequency 960 KHz DC resistance, 0.38 ohm. 6-1/2" x 6-1/2" x 8". General Radio 1482-E Standard Inductor. 1 mH, ± 0.1%. Resonant frequency 800 KHz. DC resistance 0.84 ohms. 6-1/2" x 6-1/2" x 8". HP calibrated susceptance. "GR" connectors. 0.01 - 2.0 nH. 0 - 0.005 pF. General Radio standard capacitor. 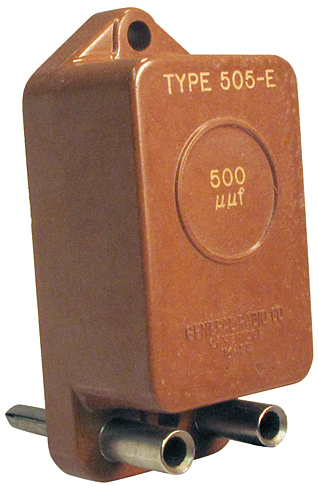 500 pF (500 µµF). 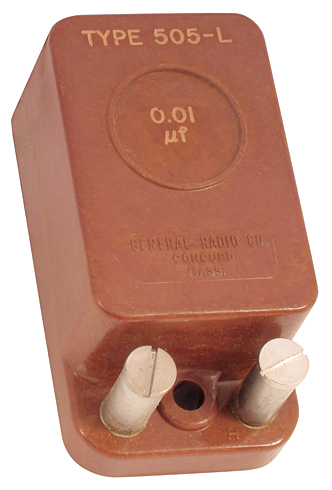 General Radio standard capacitor. 0.001 µF. 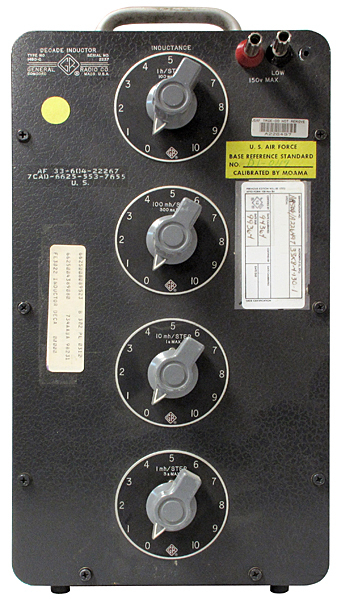 General Radio standard capacitor. 0.01 µF. 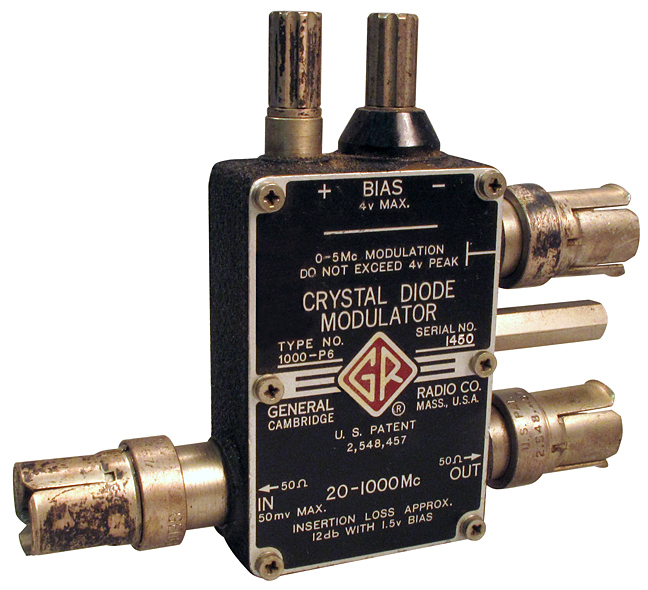 General Radio crystal diode modulator. 20 - 1000 Mc. 50 ohms input / output. Bias 4 volts max.